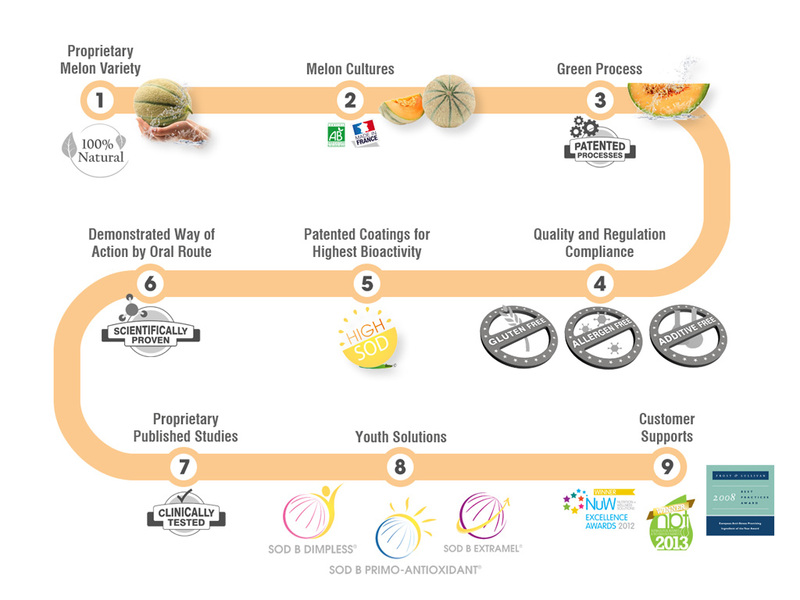 Bionov uses only one raw material: a proprietary and non-GMO variety of Cantaloup melon (Cucumis melo L.), 5 to 10 times more concentrated in SOD than a classical variety. Bionov controls all the stages of the manufacturing process from melon cultivation to production and commercialization of a high quality range of SOD B® active ingredients. According to a worldwide patented and green extraction process, Bionov produces SOD B®, a freeze-dried melon juice concentrate naturally rich in SOD. Strict quality controls are performed to meet the customers safety expectations and provide 100% safe ingredients. Bionov guarantees the highest SOD bioactivity with the development of patented adapted coatings which protect the SOD activity from degradation after both oral and topical administration. Based on a strong R&D approach, Bionov demonstrates the uniqueness of SOD B® through the elucidation of its innovative mechanism of action. Bionov has confirmed the SOD B® efficacy through the development of clinical studies on identified applications, published in peer-reviewed journals. Bionov proposes SOD B® solutions guaranteed with the highest natural SOD bioactivity, and backed by clinical efficacy in dedicated health applications. Bionov accelerates your market access by offering a large range of scientific, technical and communication supports. Bionov puts its knowledge in formulation, quality and regulation at your advantage, and provides a full support in each step of your project.